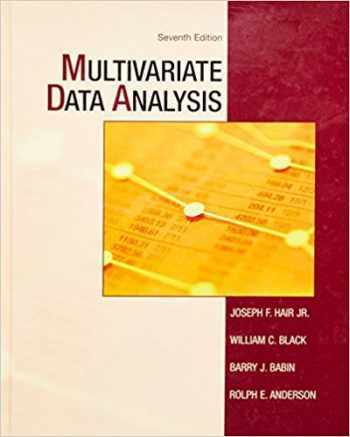 Acknowledged author Joseph F. Hair Jr wrote Multivariate Data Analysis (7th Edition) comprising 816 pages back in 2009. Textbook and etextbook are published under ISBN 0138132631 and 9780138132637. Since then Multivariate Data Analysis (7th Edition) textbook received total rating of 3.5 stars and was available to sell back to BooksRun online for the top buyback price of $61.24 or rent at the marketplace. For graduate and upper-level undergraduate marketing research courses. For over 30 years, Multivariate Data Analysis has provided readers with the information they need to understand and apply multivariate data analysis. Hair et. al provides an applications-oriented introduction to multivariate analysis for the non-statistician. By reducing heavy statistical research into fundamental concepts, the text explains to readers how to understand and make use of the results of specific statistical techniques. In this Seventh Edition, the organization of the chapters has been greatly simplified. New chapters have been added on structural equations modeling, and all sections have been updated to reflect advances in technology, capability, and mathematical techniques.